Many who have contemplated the idea that terrorism infiltration over the southern border is a potential threat, as did former Department of Homeland Security Secretary Jeh Johnson, are often asked this question: "Has a border-crossing migrant ever committed a terrorist attack?" Introducing Abdulahi Hasan Sharif of Somalia. His name is not well known. Neither is this claim that Sharif represents a significant national homeland security precedent. One probable explanation is that Sharif's alleged September 30, 2017, vehicle-ramming attack, which wounded a police officer and four citizens, happened in Edmonton, Canada, and not on U.S. soil. Those who paid attention, though, would have noticed Canadian press reporting that Sharif originally entered over the Mexico-California border in July 2011 before he was able to go on to afflict our northern neighbor. But the Sharif case remains off the grid, its potential homeland security significance unmined for learnable practical lessons at our southern border. The prospect of Islamist terrorists infiltrating the United States through its southern border has always occupied theoretical territory and has drawn its share of hyperbolic claims with no factual support on the hard political right. The objective middle truth is that terrorist infiltration over the border, with or without attacks, is a prospect that professional homeland security authorities have always taken seriously. As I explained in my recent CIS Backgrounder about the terrorist infiltration prospect, U.S. homeland security agencies have invested national treasure and human resources to reduce this threat as required by successions of national laws, strategic plans, and as required by facts on the ground. Consider, as undoubtedly do our homeland security professionals, that: Migrants with terrorism records and past associations reportedly have been apprehended crossing the U.S. Southwest Border in recent years (see also here and here). But maybe because they were caught, none attacked like Sharif, or were prosecuted specifically for plotting an attack. Also, proof of the infiltration concept came in recent years as Islamist terrorists were smuggled over migrant trails, according to Europol and other credible sources, to breach Europe's external border for the purpose of committing kinetic attacks. Some of the more notable of these included the 2015 attack in Paris and the 2016 one in Brussels by operatives who posed as Syrian war refugees. There are many others besides those. None of them simply showed up, loaded down with weaponry and explosives, and just started killing. The terrorists smuggled in camouflaged among thousands of non-terrorist migrants and then fraudulently applied for asylum as a means to gain temporary legal status and precious time and only later attacked at their own pace. The Sharif case, whether or not it followed the European pattern, nonetheless further establishes a hard proof of concept that anyone from East Africa or the Middle East who is potentially predisposed to terrorist acts can reach the U.S.-Mexico border and gain as much time as they need afterward to do whatever they want. But the main argument of this post, viewed from a border and homeland security mindset, rather than a political one, is to insist that more should be learned from the Sharif precedent. Because almost a year later too little is still known about Sharif's motives and intentions at the time he entered California through Mexico or about how he got there in the first place. These are among other important fact points that would be necessary to understand how others like him might follow so our border enforcement agencies can catch them first. 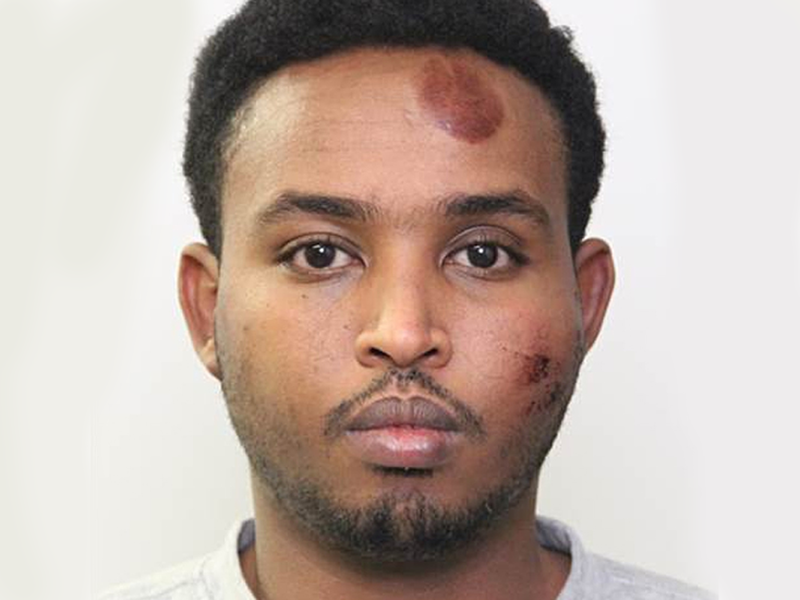 On September 30, 2017, the 30-year-old Sharif drove a vehicle into an Edmonton police officer standing guard outside Alberta's Commonwealth Stadium during a local championship soccer match. Sharif got out of the car and allegedly stabbed the officer several times before running away. An ISIS flag was found inside the car. A few hours later, Sharif showed up in downtown Edmonton driving a U-Haul cube truck. He used it to run over four citizens, per incitement propaganda regularly put out by overseas Islamic extremist groups. The truck overturned after a chase, and Sharif was arrested. All of the victims survived. It soon emerged in Canadian press reporting, which cited named U.S. Customs and Border Protection officials, that Sharif had been smuggled to the Mexico-California border on July 12, 2011, more than six years earlier. No details have been offered regarding routing or the methods he used to reach the border. From Tijuana, Sharif walked over to the San Ysidro port of entry on foot with no documents and no legal status to enter the United States, according to the Edmonton Sun. He likely petitioned for political asylum at the San Ysidro port of entry, although that is not publicly confirmed. It is not known whether Sharif triggered any national security concern upon his arrival at the California border. As I described in my recent CIS Backgrounder, Sharif would have been classified as a special interest alien when Customs and Border Protection inspectors encountered him at the port of entry, a designation triggering national security database checks on the name he gave and possibly an interview with ICE or FBI agents. For reasons that are rarely subject to public disclosure, an immigration judge ordered Sharif deported in September 2011. But Sharif couldn’t be deported. He had to be set free in November 2011 and remained, for a time, at large in the United States. My colleague Andrew Arthur has already explained how a Supreme Court ruling prevents U.S. immigration authorities from indefinitely detaining migrants like Sharif who can’t be deported, no matter how many crimes they’ve committed or how dangerous authorities think they are. Sharif was one of those we couldn’t deport because, starting in 1991, civil war and the absence of any government that could take Somalis from the U.S. meant they couldn’t be deported. It wouldn’t be until 2014 that security conditions and government cooperation had sufficiently recovered to enable the United States to begin deporting any significant number of Somali convicted criminals and those, presumably like Sharif, who had lost their asylum claims. But Sharif was long gone by then. He was under court orders to regularly check in with authorities, of course. But instead, in 2012, he legally crossed into Canada and had better luck there with a refugee asylum claim. It is not known whether Sharif, who would have been 24 years old, came in at the border already radicalized and planning violence, or if he had even belonged to a terrorist organization like al-Shabaab. And our systems at the border either missed this or detected it and didn't communicate properly to the Canadians in time. All that is known in this regard is that some 36 months after achieving Canadian refugee status, Sharif was on the radar of that country's intelligence services. By 2015, those who knew him were reporting that Sharif held genocidal beliefs related to Islamist teachings. In Canada, the RCMP's Integrated National Security Enforcement Team found cause to interview Sharif that year after he reportedly espoused extremist Islamic views. RCMP Assistant Commissioner Marlin Degrand told the Toronto Star there had been insufficient evidence to charge him or issue a peace bond at the time. Sharif is mentally fit to stand trial. His trial attorneys have repeatedly argued that he was not. But judges twice have ruled that Sharif understood what he was doing and why he is on trial. No information has been publicly offered as to why Sharif's lawyer might think he was mentally unfit to stand trial on the five counts of attempted murder, just that he was. The Canadians have not charged Sharif with terrorism-related crimes but, rather, with 12 counts of attempted murder, dangerous driving, and aggravated assault. Trial is tentatively set for October 15, 2019. As of this writing, no major traditional U.S. media outlet has noted that Sharif represents North America's first attack by a border-crossing migrant who originally came in from Mexico. And so it follows that few have pressed important questions. Answers would inform how we should even think about this case in ways that would maybe help thwart other Sharifs. Did an intelligence failure occur that needs to be corrected in which Sharif's background, motives and connectivity to designated terrorist groups would have been detected and passed on to the Canadians? Why did a U.S. immigration judge order Sharif deported and, in all likelihood, reject his asylum claim? To what extent was Sharif already radicalized, meaning predisposed to committing terrorist acts, when he first crossed six years earlier? Did he have any known connectivity in the old country to an Islamist terror organization like al-Shabaab that originally set him on a course to eventually commit an act of violence? Or did Sharif develop his own quiet game plan, independent of any group, to commit terror before he set out for the American border? Was Sharif a benevolent economic or politically persecuted refugee who only radicalized years after he arrived and so couldn't have been detected as dangerous under current protocols? Did a correctable failure occur at any juncture in bilateral systems currently in place with Canada, to discern that a judge had already ordered Sharif deported and may have had derogatory intelligence about him before he achieved status in Canada? What travel methods and smuggling techniques did Sharif exploit to reach the Southwest border? Answers to these seven questions, about an unprecedented occurrence like this, are fundamental to usefully inform American and Canadian security leaders who make resource decisions, set enforcement priorities, and plan operations for the responsible front-line agencies. Lastly, the Sharif case provides a rare case study to inform thought leaders and members of the media about how to begin considering special interest alien travel in any further discourse about immigration enforcement policy and reform proposals. Until we know more about it, the Sharif case blares the message: Maybe next time, the attack will happen soon after the border entry, as part of a kill plan, inside our country. Preemption is always better than reaction.